better than 50% of Type 304. These rates are for carbide tools, Type C-2 for roughing, drilling and reaming. Type C-3 for finishing . These machinability ratios must be recognized as approximate values. They are a reasonable guide to relative tool life and lower required for cutting . It is obvious, however, that variables of speed , cutting oil , feed and depth of cut will significantly affect these ratios. MONEL TM and INCONEL TM are Trademarks of Special Metals Corp.
Waspaloy is a Trademark of United Technology Corp.
RENE is a Trademark of General Electric Corp. When band sawing these alloys, the more economical high speed steel blades can be utilized. 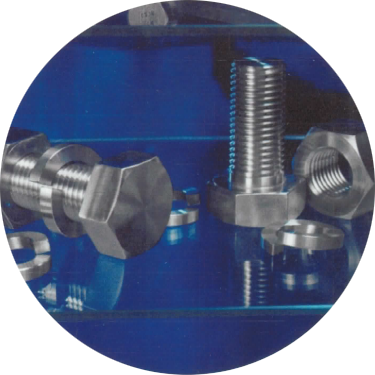 The machine must be set up to cut at much slower speeds to use the high speed steels. Some equipment does not have the capability to slow as much as needed. Blades that are 1.5-2" wide or wider are recommended to provide a rigid set up. Tungsten carbide blades can be utilized and can cut much faster, the trade off will be the number of cuts per hour vs. the higher cost of the blade. Grinding should be performed submerged or flooded with water soluble coolant. Soft materials may be gummy and may cause the need for the wheel to be dressed more often. Some aerospace grades do not allow grinding, as it can alter the properties of the material. Many of our materials are austenitic, and some are only slightly ferro-magnetic. When utilizing magnetic hold downs, be aware that other holding methods may be needed. NITRONIC is a Registered trademark of AK Steel (Armco).